This article is about an American food. For the traditional, yeast-based Dutch dish, see Poffertjes. 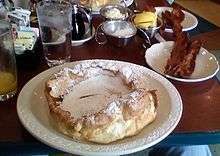 A Dutch baby pancake, sometimes called a German pancake, a Bismarck, or a Dutch puff, is a sweet popover that is normally served for breakfast. It is derived from the German Pfannkuchen. It is made with eggs, flour, sugar and milk, and usually seasoned with vanilla and cinnamon, although occasionally fruit or another flavoring is also added. It is baked in a cast iron or metal pan and falls soon after being removed from the oven. It is generally served with fresh squeezed lemon, butter, and powdered sugar, fruit toppings or syrup. A basic batter incorporates 1/3 cup flour and 1/3 cup liquid per egg. According to Sunset magazine, Dutch babies were introduced in the first half of the 1900s at Manca's Cafe, a family-run restaurant that was located in Seattle, Washington and that was owned by Victor Manca. While these pancakes are derived from the German pancake dish, it is said that the name Dutch baby was coined by one of Victor Manca's daughters, where "Dutch" perhaps was her corruption of the German autonym deutsch. In 1942, Manca's Cafe owned the trademark for Dutch babies, although the cafe later closed in the 1950s. The Dutch baby is a specialty of some diners and chains that specialize in breakfast dishes, such as the Oregon-founded The Original Pancake House or the New England-based chain Bickford's, which makes both a plain Dutch baby and a similar pancake known as the Baby Apple, which contains apple slices embedded in the pancake. It is often eaten as a dessert. A David Eyre's pancake is a variation on the Dutch baby pancake named after the American writer and editor David W. Eyre (1912–2008). ↑ Hirtzler, Victor (1919). The Hotel St. Francis Cook Book. p. 381. Retrieved 2014-01-29. ↑ "Dutch baby, the love child of the breakfast table" Chicago Tribune. Retrieved 2014-12-30. ↑ "Dutch baby pancakes," Sunset (magazine), February 1960. ↑ Albala, Ken (2013). Pancake: A Global History. Reaktion Books. p. 10. ISBN 9781780232379. A Dutch baby pancake fresh out of the oven and ready for breakfast; grapefruit in the background.